Within the month of May 2018, Carmo will be inaugurating an additional 1.000 sqm production facility. The controlled environment for injection moulding with an indoor height of 10 meters, will be serviced by a crane with a capacity of 10 tons and an adherent clean room area. 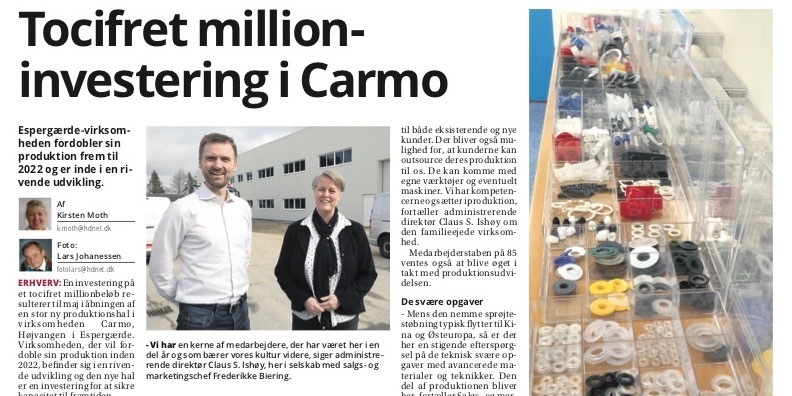 Being based in Denmark, Carmo run a highly automated production including robotics and vision technology to enhance delivery of high quality, well-defined properties, and functionality at competitive prices. Carmo has a 60 years track record of delivering highly specialized medical and technical plastic and PVC components. Our products are sold to more than 500 customers and 70 percent of the production is exported world wide. The product portfolio includes own brand products as well as several customer specific/OEM items. This new facility is built to support Carmo’s further offering of high quality components to existing as well as new customers. At Carmo we are looking forward to take these new facilities into service, and we will be happy to invite existing and new customers to a dialogue on how we can assist in the design, ramp up and production of your next injection moulded component.